Meet Lindsay – winner of Labcold’s BBTS Glasgow 2017 competition! Back in September we ran a ‘Spot the Difference’ competition at BBTS Glasgow featuring a picture from Becky at BHRUT of the #hellomynameis gnome Gnoma and Labcold penguins. We received a LOT of entries over the 3 days of the conference, but to be honest not that many right answers…maybe being in the amazing city of Glasgow was a bit distracting for some delegates! Back at Labcold HQ we put all the correct answers in a box and drew out Lyndsay as the winner. 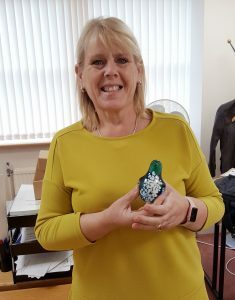 We hope you like your handmade, limited edition Bath Aqua glass penguin Lindsay. Thank you for entering our competition and hope you enter out competition at BBTS Brighton 2018!